Prior to reading The Garden of Small Beginnings, I would never have thought that grieving and gardening could be woven so perfectly into one story. However, Abbi Waxman does exactly that throughout this book. It’s impossible not to fall in love with Lilian, a young widow who is still trying to come to terms with the death of her husband four years later. Lilian’s honesty, humor, and irreverent comments are perfectly balanced against the tragic reality that she is a grieving widow. Lilian manages to laugh at herself and invites us to laugh along with her as she deals with everyday life, including working at a job she doesn’t love, raising two adorable yet high-energy daughters, and dealing with a mother that seems to be the “mother of all mothers.” Thank goodness Lilian has her amazing sister Rachel to help her power through those times they spend with their mother!!! Perhaps the best part of this book is that Lilian lets us see that she is far from perfect. I laughed a lot while reading this amazing novel. That’s something you wouldn’t expect after reading the book’s description. I don’t like when reviews give away the best parts so I’ll just tell you that reading this book will give hope to those who need it. As for the gardening, let’s just say not only do I NOT have a green thumb, but I have never been the least bit interested in gardening! Just a few chapters into the book, all of that began to change though. 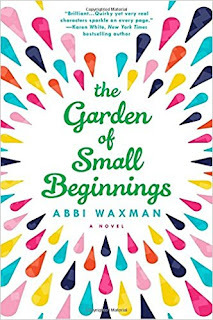 Between each chapter Ms. Waxman inserts a brief synopsis about gardening different vegetables, herbs, etc. Even those chapters were hilarious. For the first time in my entire life I found myself thinking of turning part of my backyard into a garden! If you are thinking to yourself “forget it, I’m not reading a gardening book”- don’t worry…THIS IS NOT A GARDENING BOOK! It IS, however, a feel-good, hate-to-put-it- down, kind-of-book! Ms. Waxman has harvested a fan out of me! If she writes it, I will read it! So I hope she’s writing another book as I write this review!!! Giveaway ends May 7th at midnight EST. I cannot garden since my hands are weak and hurt from RA. We are moving this spring so hoping to finally have a space to try to garden. I am not good with houseplants so hope this is not a sign! I've never tried gardening, but I've considered it. One day, perhaps, if I'm not too lazy. What is your favorite book that involves flowers or gardening? Do you like gardening? Why or why not? I'm a terrible gardener! I love the flowers and planting but I do not have a green thumb. Can a person love gardens but not like gardening? That's me. I love looking at people's landscapes while driving around town. I get ideas for my own garden, but I don't implement them as I am not able to garden. I can do a little maintenance by removing dead flowers and cutting back on bushes. I've browse through many books but can't remember specific titles. If I had a garden I would grow fruits, vegetables, and lots of flowers. I love to garden. I love to plant different kinds of flowers, the more unusual the better for me. One flower bed is just dedicated to wildflower, another bed has black eyed susans. This year I will have 6 different kinds of sunflower. Not only do I love the flowers but the deer that come visit our yard love them also. Our 4 year old loves cherry tomatoes off the vine. This year he helped plant them and takes ownership in watering. It's been rewarding each year to garden as a family. The only thing I can grow successfully is weeds. I even managed to kill an air fern. I can think of a million things I'd rather do than garden. I do a little gardening. I have mostly perennials and raspberry plants. I like stuff that comes back every year. I love gardening. I have a big flower garden. I love gardening! When I was younger, we lived in the apartment above my grandparents. They had an enormous garden and I loved helping my grandmother in it. My favorite thing was picking peas and getting to eat some right there in the garden. They were so wonderfully sweet. I can taste them still. My favorite book that includes a garden has to be The Secret Garden, of course! I didn't like it so much when I was younger, but when I got older, I re-read it and loved it! As for being a gardener myself...not so much!! I can't seem to keep anything alive!! My mom thinks it's hilarious but she's not the one who sits and wonders what exactly is in the air over here at my house! Hehee!! Thank you for the opportunity! I love to garden! It's therapeutic for me to spend time in my yard and see beautiful things grow. It also makes me proud, and it's something my husband and I like to work on together. We planted several new flowers this year, so we are in the stages of watching things grow, which is so much fun and rewarding, too. I also have a favorite garden book - The Forgotten Garden by Kate Morton.